Payes Automotive has been accredited by the BBB, which means that the BBB has determined that Payes Automotive meets the BBB accreditation standards. This also means that Payes Automotive has made a commitment to provide honest and valuable automotive services, with the BBB there to back them up, and ensure that the customer is treated fairly with each and every service. 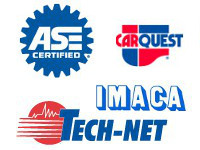 We build trust by recommending only the automotive services that you truly need. Your neighborhood mechanic - Call 623-780-1666 or stop by today!